I’ve reviewed most of the well known multi level marketing opportunities and now it is Mary Kay’s turn. So what is Mary Kay and is this a viable opportunity for you to try and make an income? Introduction: What is Mary Kay? Mary Kay is a multi level marketing company that supplies skin care products, cosmetics, fragrance and gifts mainly for women. They also have a small range for men. Mary Kay was found in 1963 by Mary Kay Ash and in 2011 Mary Kay was the sixth largest direct selling company in the world. 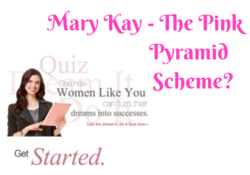 Why do they call Mary Kay the “Pink Pyramid Scheme”? Yes Mary Kay has been dubbed The Pink Pyramid Scheme. Not exactly a good reputation to have if you ask me. The complaints about deceptive methods to lure you in are heart breaking. If you check out Wikipedia they say that the average Mary Kay consultant earns $1 250 per year (2010)…. This doesn’t amount to much now does it, that is around $100 per month, plus consultants are encouraged (ie pushed) to purchase for their own use. Yet Mary Kay gives the impression you will have such a glamorous lifestyle selling their products.and earn such a huge amount of income. Keep in mind too that being mlm this average is not equal per consultant, most of this income will be spread among a few lucky ladies that got in first and the rest of the consultants are probably paying in! This is the nature of a pyramid scheme.. oh sorry, I meant mlm. Well you are welcome to read what I think about multi level marketing… and of course there are all the articles online about Mary Kay being a pink pyramid scheme, as well as all the complaints about them… but once again they have been investigated numerous times and they have passed the test.This goes for plenty of other mlm opportunities, they get investigated and just get away with it. There is such a small difference between multi level marketing companies and pyramid schemes. Multi level marketing companies have products and pyramid schemes don’t. It makes it easy to disguise a pyramid scheme though doesn’t it? Just only old product to your pyramid scheme and off you do, suddenly it is multi level marketing! Let’s look at some big brand names and their reputation… Coca Cola, IBM, Samsung, Louis Vuitton, Gillette, Nike, mostly good right? Now think of a well known multi level marketing company… what came to mind? Suddenly the reputation is tarnished. Maybe you think they are fine and have a good reputation but just go and look online at what is being said about them. You won’t find quite the same magnitude of complaints about Louis Vuitton or Nike would you? 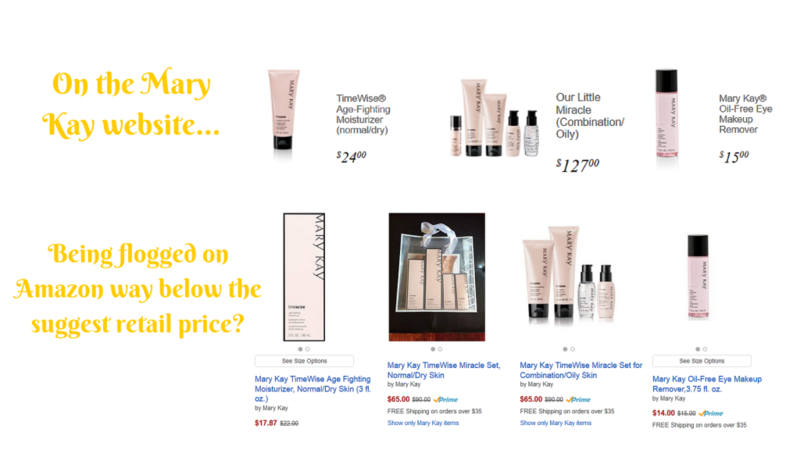 And here is something interesting for you to ponder (and this came up in my Amway review too), why are Mary Kay consultants flogging their products? It is against the rules of Mary Kay to sell their websites like Amazon or eBay. Mary Kay even sued Touch of Pink cosmetics for buying products from former Mary Kay consultants…. well if someone launched a business selling the products from former Mary Kay consultants there must be a huge amount of former consultants with a massive amount of products right? OK so if you love mlm and you don’t mind selling a product that has a lot of complaints about it then I suppose yeah ok go for it. Just remember that mlm is not for everyone and most people won’t succeed. Once again there is too much smoke for there not to be a fire with this one. As with most major multi level marketing companies you will find so many negative reviews as well as positive. The positive reviews are quite frankly dubious considering that they are trying to sign you up so I believe these can’t be trusted. Think about some really great beauty products, let’s take Estée Lauder or L’Oréal for example… how many complaints do you find online about them? How much smoke surrounds these products? Not much BS is there? This is because these are real products being sold by real companies… these are not products made to cover up a pink pyramid scheme. Well here’s the thing, if you want to sell beauty products online well just start your own website and you can promote any beauty products you want. You can tell your readers what products you enjoy and what products you don’t enjoy…. yes you can be an affiliate marketer and be in complete control of your own business. Check the differences between mlm and affiliate marketing here. You won’t need to recruit anyone! Alternatively if you are keen to try this out, why not rather look at the Avon mlm opportunity? At least they appear to have a better reputation than Mary Kay does. If you want to learn how to set up your own online business, build your website and start making money online have a look at my #1 recommendation. Nothing underhanded or suspicious about this opportunity and the best part is you don’t have to spend any money either. I have read in the past that Mary Kay was rated as one of the best places to work in America, but I did not know that they had such a bad reputation online at all. Without this review, I would only have good things to say about them. Why are their products so high in cost? As a smart shopper, I always do price comparisons and I know that Amazon will most likely have the best prices online. MLM is just not my cup of tea at all, there is no guarantee that I will see my return on investment and as you mentioned: most people fail in this gig. I personally prefer to have my very own business online where I am totally in-charge. I totally thank you for giving me some solid info on Mary Kay. I will surely not be recommending them to anyone as a real business opportunity. But that’s the interesting thing, they are not allowed to sell Mary Kay products on Amazon! From what I understand that because consultants and ex consultants are trying to get rid of their stock. Perhaps actually working for Mary Kay as an employee is one thing, but to be an independent consultant working on a multi level marketing business model? Nope not good! I don’t use Mary Kay’s products but I know someone who buys it from her consultant. Mary Kay has been around for a number of years and I guess they have loyal customers. Why they are still in business if they are that bad? You have a great point there, but why are other huge MLM companies like Amway, Jeunesse and Herbalife still in business? I remember being invited to join a large MLM outfit whose name I won’t mention. I was invited to a meeting where the joys of becoming a consultant were outlined. It was a very long presentation that focused almost entirely on selling us the dream of wealth and financial independence. Almost all of the group oohed and awed. They were planning their dream holidays and flash cars. Some of them bought into it including the couple who invited me to the presentation. The product wasn’t even mentioned until the presentation was coming to an end and I asked about it. After putting a lot of time and effort into it – my friends gave up. Excuse my cynicism, but when I come across anything that is trying to sell the dream rather than outlining some of the practical realities – my radar flashes a warning. That is exactly it EoinMc! They focus on the dream and how recruiting others in “the dream” will make your dream come true… they spin out unrealistic figures and everyone gets excited. But where is the reality, the hard work… the fact you have to hard sell and push your product and “the dream” on other people. It just isn’t something I am cut out for. I think a lot of people get into MLM programs because it’s a brand they trust and like. With that being said they will generally have to sell their products to their family and friends. Then you’re going to ask for referrals. Basically, you’re always going to be looking for new prospects in order to generate some decent income. For me, I haven’t ever really been a fan of MLM programs. It just seems to be a lot of work and you constantly have to reach out to new clients. I guess you could always setup a website and SEO it, but then again I would lean towards affiliate marketing. Affiliate marketing is just more lucrative. Just interested to see where you found they are a pyramid scheme though? There are lots of interesting articles calling them the Pink Pyramid Scheme… I’m going to be writing another post on this exact topic so come back and check it out. Thank you Lynne for a great review. I plan to stay as far away from Mary Kay as possible thanks to you. Associating them with something like Amway – meh – not for me – lol. I did not find their product that great to begin with and certainly would not feel comfortable trying to sell it to others, especially now. Yes it seems to me to be just another pathetic mlm, sorry but I really don’t enjoy mlm opportunities at all. It does appear as though no one here is an MLM fan or a product of any MLM fan but keep in mind that MLM advocates do exist and as you said are loyal to the brand. 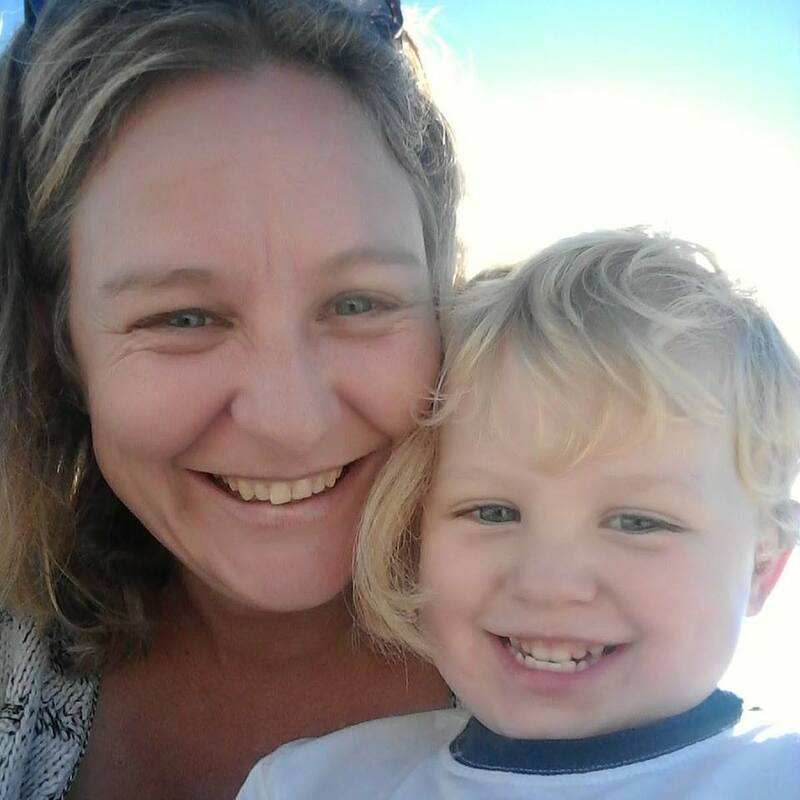 I actually like the idea that if I recommend something to you that I get a commission (Affiliate Marketing) but if you recommend it I get a small commission too (network marketing). Have I ever made 20g per month doing it, no, but I still like the idea of tiered compensation. I actually think that is really fair to me and to you as well. Unfortunately, like you said, most of the old MLM’s require you to “buy-in” but more and more on the internet, you are seeing free trials that might eventually lead to sales and a multi-tiered compensation plans. So although I agree on some points, I will have to respectfully disagree when it comes to “throwing the baby out with the bathwater”. Two weeks ago, I got a free affilaite account of a muti tiered product and promoted it just a little bit, got a couple of sales, made almost an extra $100 in commissions. Now if I buy just $30 per month of the same product, i will get a percentage of whatever the persons who bought the product from me sells and I would think they will probably sell some because they liked the product and signed up for a free affiliate account AFTER they bought the product, unlike me. It’s now up to me to decide if I will spend $30 of the 100 to hedge my bet on the possible increased profits that might come. Actually because the folks that bought the stuff from me liked it so much, I now want to try it myself. LOL You see, now, I am not focused on MLM or failures of other companies or involved in the rhetoric of whether MLM is a scam or not. I’m focused on whether I am going to do business following this business model. After all, iIam in this business to make money but I am also an honest business man and I won’t do anything that would violate my morals. You’ve made some good points there, and yes MLM does work for some people, for sure. I would be very interested to hear back from you and find out how things work out for you if you pay the $30 per month… so please come back and let us know. I think the main thing here is, like you said, to stay honest and true to yourself. So if that particular MLM works for you and is in line with your morals that is awesome. I have yet to find an MLM that is in line with what I feel is honest. I can’t understand why I can’t promote a product without buying in. I don’t like that at all and I don’t like promoting an opportunity that you will have to buy in to make money. This is why I am such a fan of affiliate marketing as opposed to MLM.